Today your brand is defined by its content online. And the data now measures its impact. The conversations and buzz are often hidden and “ephemeral.” Spreading into the digital corners of human consciousness. But many businesses are either not aware of them or don’t realize their importance in our increasingly digitized world. The knowledge economy that sits within our digital world is an eco-system that is moving the foundations of power from physical to abstract and invisible. Is your marketing manager ready? Digital marketing took an axe to the job description of the marketing manager. Many of the growth tactics that worked in the past have stalled or stopped working. The rise of new tools and technology made marketing 101 look a little dated and in need of a renovation. Requiring a serious makeover. In the past they could hide behind the “Ad” and the PR agency. They did the creative, negotiated with the media and you could blame them if things didn’t work out. It was easy not to be accountable. Mass media metrics are almost impossible to measure back to results. Digital has moved accountability from opaque to transparent. Is your key growth tactician still using the tools they learnt 20 years ago? Have they evolved and adapted? Today a CMO needs to understand all the new components that make up digital marketing plus traditional marketing. Here are just a few of the categories that now need the modern CMO’s attention: Many of these did not exist 10 years ago. Social media marketing – We know what this is. Content marketing – Adding value to your projects and customer with valuable content. Email Marketing – It’s been around a while but still key. Paid digital marketing – Facebook and Google are your top 2 and each of these are disciplines in their own right. Search engine optimization – Ranking on the first page of Google is now worth aspiring to. Influencer marketing – Reaching trusted audiences via influencers. But before you rush in you need to know where you are starting from. 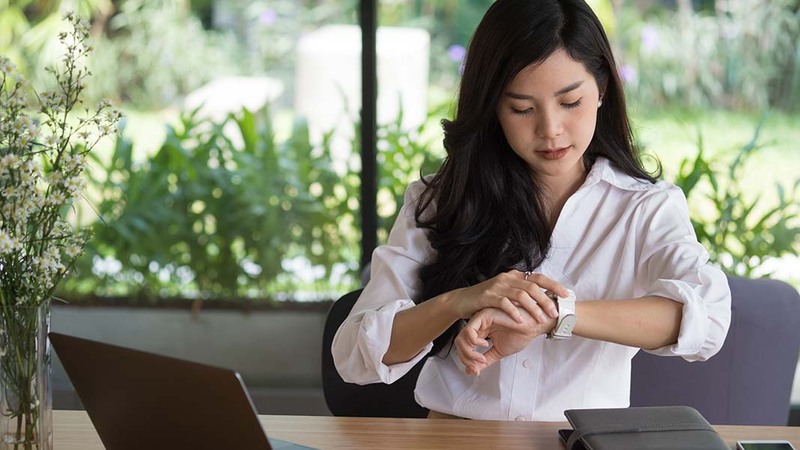 In the rush for a quick fix and instant gratification the marketing solution is often seen as Facebook advertising replacing other paid brand building activities such as radio and television. But digital marketing is not just Facebook advertising. It is just one sliver of what you should be doing. Playing the long game is what effective digital marketing is also about. Growing and building substantial digital assets. These are assets that will keep giving. Digital marketing and advertising should not just be treated as an expense, but as assets. If you are well into the digital journey then you will have built digital assets. They are investments in building bits and bytes that show up and include traffic, social sharing and earned attention from Google. One way of looking at these is to put them in two boxes. Soft digital assets – Ones that are hard to see and measure. Hard digital assets – Those that are more visible and can have metrics put next to them. They can also be described in their totality as digital intelligence. 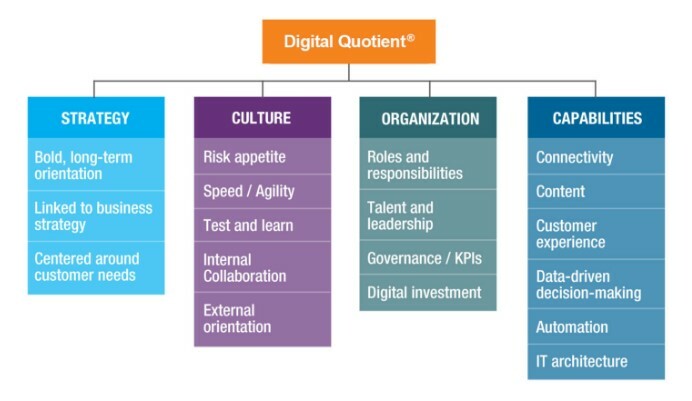 McKinsey uses a term “Digital Quotient” or DQ to describe the digital intelligence of an organization. Distilling the big messy list into the essential 4 provides some clarity. This is what you need at a high level. This is soft digital power. Agility – Learn fast, being prepared to fail fast and often, collaborating externally is now possible and easier. Ability – Having the right skill sets within the organization and also access to external resources that know what they are doing can accelerate the growth of your digital assets and performance. If we look over the components in the McKinsey Digital Quotient there are a few categories that stand out that are hard to measure. And they are soft digital power. Culture – Does the organization have the mindset for embracing the digital economy. Is the CEO on board? Are the executives dinosaurs or digital natives? And with that comes elements such as risk taking and the ability to embrace some failure as a strength. Learning from mistakes and being agile enough to iterate and evolve quickly. Expertise – Does your team have the skills you need to move into the future. Or are they lacking the essentials? Customer experience – What are your prospects and customers experience when dealing with your brand online? Hard or easy. Confusing or intuitive? Knowing where you are starting from provides the baseline to see if you are moving forward when you start making this first steps. There are many types of hard digital assets. Digital brand – Online brand and positioning. Share of voice, testimonials on social and other websites. Technology can reveal how you are compared to your competition. This is now measurable. SEO – Search engine authority. This is broken into 2 key pillars. Making sure your site is technically structured to give the right signals to search engines. And quality content that is linked to by other websites and creates online conversations and reach. Email lists – What is the size and quality of your vital email subscriber list? Social media followers – Do you have your own channels and distribution to get your brand voice heard? What networks are you on and are they the right ones. Website traffic – How many page views are you getting every month. How many unique visitors. People that haven’t visited your site before. Social traffic – As we move from an Internet of websites to an Internet of apps and platforms the conversation is happening away from our owned digital assets. Content assets – Sitting under this umbrella are a range of multi-media assets that provide different ways to communicate with peoples various modalities of consuming and learning. Some like to listen (podcasts) and other like to watch (videos). External online relationships – What online influencer and collaborations have you put in place? Measuring these provides the reference point to put a strategy together. To build digital assets that you may have ignored or need to build. Once you have these measured and identified the strengths and weaknesses then you know where to start. Do you need to convert more of those into leads? What’s your baseline? What do you need to work on? This will be vital in putting together your digital marketing strategy. Jeff Bullas is a consultant, blogger, strategist, and speaker. He works with companies and executives to optimize their online personal and corporate brands through the use of social media channels. Author of the Amazon best-selling book Blogging the Smart Way—How to Create and Market a Killer Blog with Social Media (Jeff Bullas, 2012), Jeff's own blog is included in AdAge.com's Power 150 ranking as a top 50 marketing blog.